I was trying to think of something clever to do with my swiss chard, because I’m trying to eat up everything in my refrigerator before heading to visit family for Passover. 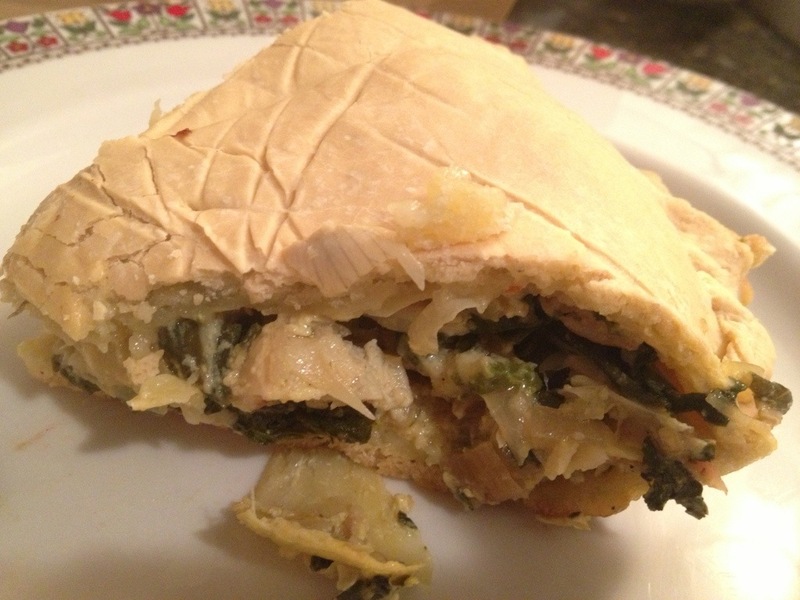 So, I came up with this Gluten-Free Swiss Chard and Artichoke Pie using the Chebe dough. NOTE: I DO NOT use cheese in the crust. Over high heat, bring chard leaves and stems to a boil in a pot of water. When it reaches a boil, simmer for just a few minutes until they’re wilted. While the chard is boiling, in another pan, saute onions and garlic in olive oil over medium-high heat until onions soften. About 2 minutes or so. I like to cook mine a little longer so some caramelize. Remove chard from water and squeeze out as much liquid as possible. Add to saute pan along with the artichokes and chili pepper flakes. Saute until everything is warmed through, about 3 minutes or so. Grease pie plate well. I just rubbed olive oil on the bottom of it. With your pie dough, split it in half and roll out 1/2 between 2 pieces of parchment paper. (See instructions below). 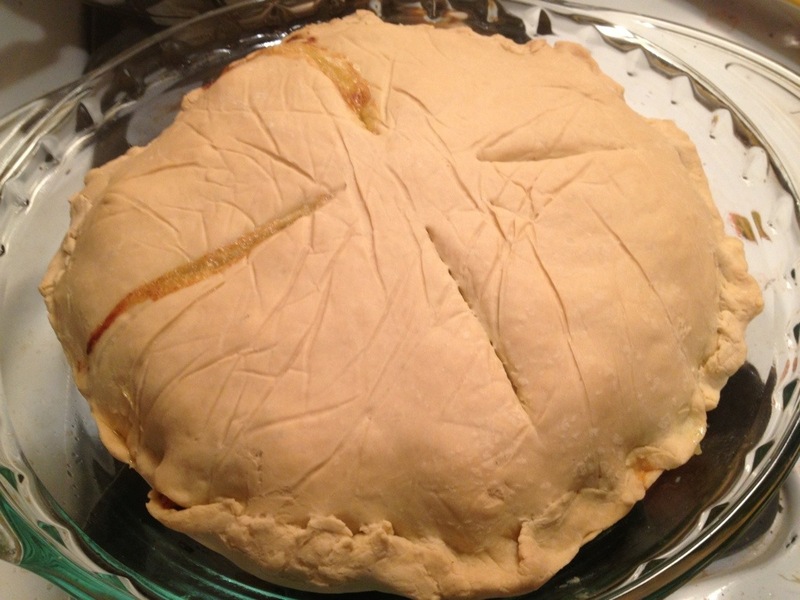 Remove the top sheet of parchment paper and place pie plate upside down over the crust. Together, flip the pie plate and the crust over. Then slowly remove the parchment paper. 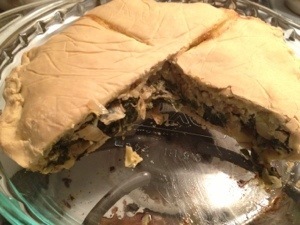 Place the chard mixture on top of the pie crust. Then, roll out the other 1/2 of the pie crust. 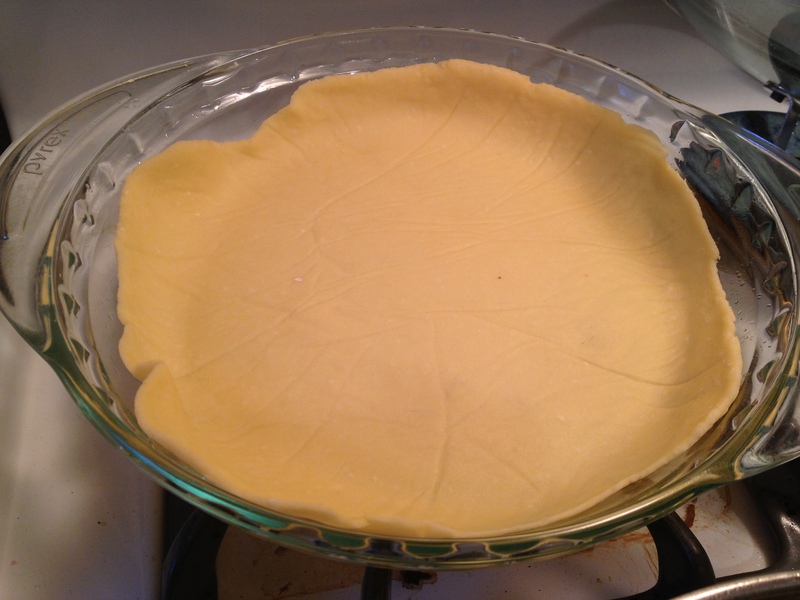 Remove the top parchment sheet, and carefully turn it over and place it on top of the pie. Pinch the top and bottom crust together as best as you can. Use the egg white mixed with 1 tsp of water. Brush on top of the pie. (I forgot to do this, but it’s why mine is not shiny). 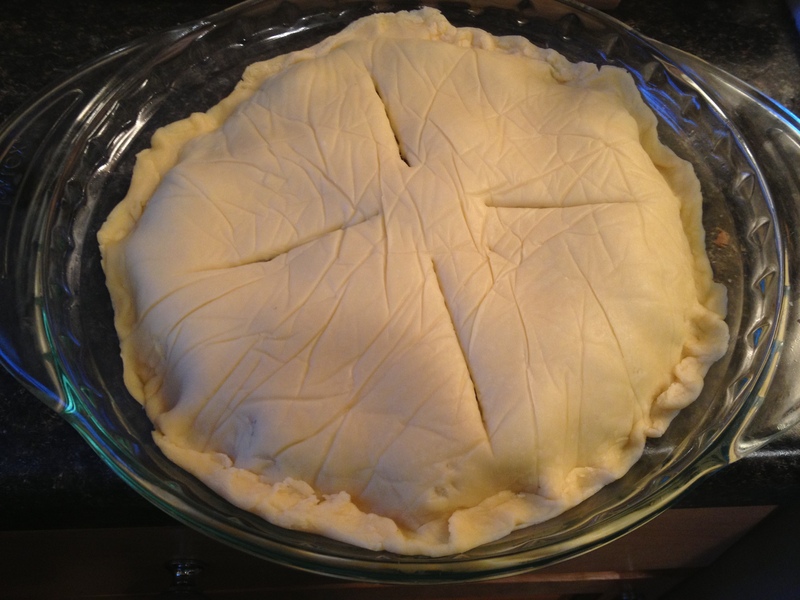 Cut at least 4 vent holes in the top of the pie. Add the dry mixture, and continue to use the fork, pushing it down and scraping it across the liquid until it gets clumpy. At this clumpy point, I stick my hands in and keep kneading it until it is super smooth. If done right, it should not be sticky at all. It only gets sticky when too much water is added, so err on the side of caution. If after about 2-3 minutes of kneading, it is not coming together, add just a tiny bit more water, but do no use as much as a tablespoon. Split the dough in half, and put one half between 2 pieces of parchment paper. Roll out until it is a bit wider in diameter than your pie plate, because you want it to come up the sides. Slowly removed the top parchment paper and put the greased pie plate upside down, over it. Together, flip them over. Do the same process in #4 for your 2nd half of the dough. It was truly amazing, and my daughter ate the whole thing!!! You can also try to make this as little appetizers, by making it in individual muffin tins. So, the way this recipe came about wast this . 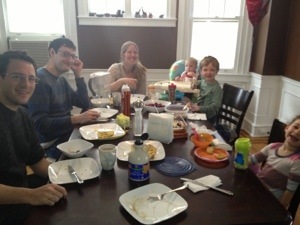 . . our friends were coming in town and we and another local couple decided we would host them for brunch. My local friends decided to make frittatas, and I decided I would make some kind of baked good. Then, our out-of-towner friends had a change of plans and couldn’t make it. Our local friends and I decided we should still get together. Since we weren’t going to be at my house and pancakes were way too time consuming, I came up with the dutch pancake and maple and brown sugar oatmeal using my oats from GF Harvest. (If you want to see how I made blueberries and cream oatmeal, then click here.) I think I made everything in about 30 minutes. This was indeed a great decision. Since I’m dairy-free right now, I thought about making it full of dairy and just not eating it, afraid it would come out kind of gross, but that was NOT the case. It was amazing and we had none left after feeding 4 adults and 3 kids!! I doubled my recipe, so if you want to halve it, it will fit into 1 pyrex pie dish or cast iron skillet. Place butter in pyrex dish and place in oven. While butter is melting, whisk together milk, eggs, sugar/maple syrup, salt. Then slowly add in flour. Remove dish from oven and pour in batter. 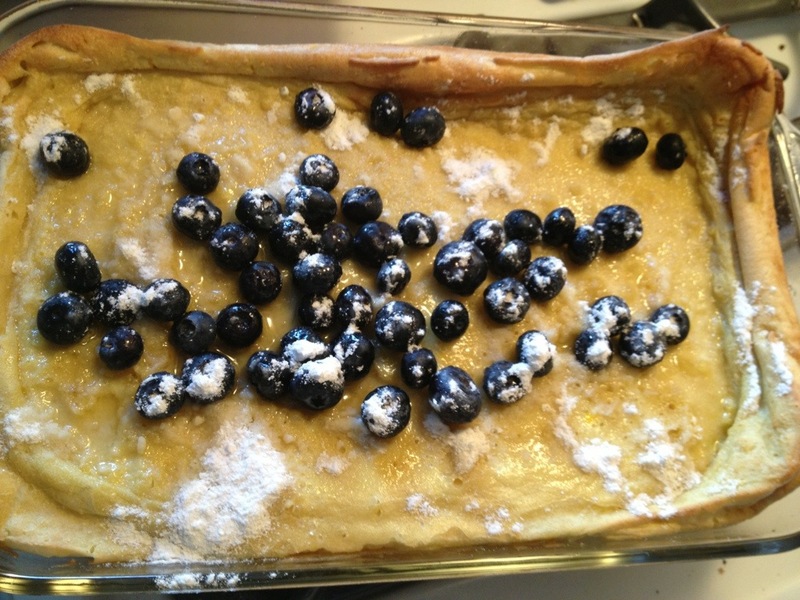 Remove and sprinkle powdered sugar on top. 1. 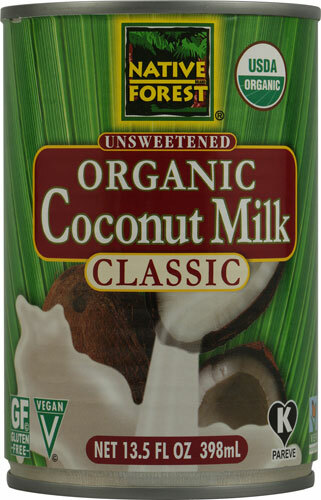 Pour coconut milk from can into container with lid (so that you can shake it). 2. Add 1/2 can of water to the canned milk. 3. Shake the 2 together. If you want to make a drink out of it, add honey to taste. It’s delicious and refreshing!